"Anantah vai Vedah", the Vedas are unending. The seers have, however, revealed to us only a small part of them but it is sufficient for our welfare in this world and next. We are not going to create many universes like Brahma that we should know all the Vedas. We need to know only as many as are necessary to ensure our good in this world. In each of the four Vedas there are different "pathas" and "pathabhedas" or "pathantaras". The same musical composition or raga is sung in different "panis". For instance, the same musical composition or raga is expounded in different styles by, say, Maha-Vaidyanatha Ayyar, Konerirajaouram Vaidyanatha Ayyar and Sarabha sastri. Just as in some panis there are more sangatis to a composition than in some others, there are more suktas in some pathas than in others. There may also be differences in the order of the mantras. Each pathantra or each version is called a sakha or recension. The various sakhas are branches of the Vedic tree, indeed a great tree like the Adyar banyan [in Madras]. The branches big and small belong to one or another of the four Vedas, Rg, Yajur, Saman and Atharvan. Modern indologists are of the view that the Rgveda came first, that the Yajurveda came later and so on. But, according to our sastras, all Vedas are eternal. To state that one Veda belongs to a period prior to, or later than, another is not correct since all the Vedas are associated with the sacrifice that came to mankind with creation itself. The same argument holds good in the matter of fixing the dates of the divisions of any of the sakhas - the Samhita, the Brahmana and Aranyaka. The Vedas belong to a realm in which there is no scope for any research. If we believe that they were discovered by seers who knew past, present and future -- themselves, though, remaining in a state beyond time -- we will realise that it is meaningless to attempt to fix their date. In the Rgveda itself the Yajurveda and the Samaveda are mentioned in a number of passages. In Purusasuktha occuring in the Rgveda (tenth mandala, 90th suktha) there is a reference to the other Vedas. We learn from this, don't we, that one Veda does not belong to a period prior to, or later than another? I stated that each recension consisted of the Samhita, the Brahmana and the Aranyaka. When we speak of "Veda-adhyayana" (the study or chanting of the Vedas) we normally have in mind the Samhita part only. When we bring out a book consisting of the Samhita alone of the Rgveda we still call it the "Rgveda". The Samhita is indeed the very basis of asakha, its life-breath. The word means "systematised and collected together". The Rgveda Samhita as all in the form of poetry. What came to be saled "sloka" in later times is the"rk" of the Vedas. "Rk" means a "stotra", a hymn. The Rgveda Samhita is made up entirely of hymns in praise of various deities. Each rk is a mantra and a number of rks in praise of a deity constitute a sukta. The Rgveda, that is its Samhita, has 10, 170 rks and 1, 028 suktas. It is divided into ten mandalas or eight astakas. It begins with a sukta to Agni and concludes with asukta to the same deity. For this reason some believe that the Vedas must be described as the scripture of fire worship, a view with which we would be in agreement if Agni were believed to be the light of the Atman (the light of knowledge of the Reality). The concluding sukta of the Rgveda contains a hymn that should be regarded as having a higher significance than the national anthem of any country: it is a prayer for amity among all nations, a true international anthem. "May mankind be of one mind, " it goes. "May it have a common goal. May all hearts be united in love. And with the mind and the goal being one may all of us live in happiness. " "Yajus" is derived from the word "yaj" meaning "to worship". "Yajna" (as we have already noted) is also from the same root. Just as "rk" means a hymn, "yajus" means the worship associated with sacrifices. The chief purpose of the Yajurveda is the practical application of the Rgvedic hymns in the religious work called yajna or sacrifice. The Yajurveda describes in prose the actual conduct of the rites. If the Rgveda serves the purpose of adoring deities verbally the Yajurveda serves the same purpose through rites. The Yajurveda is different from the other Vedas in that it may be said to be divided into two Vedas which are considerably different from one another: the Sukla-Yajurveda and the Krsna-Yajurveda. "Sukla" means white, while "Krsna" means black. The Samhita of the Sukls-Yajurveda is also called "Vajasaneyi Samhita". "Vajasaneyi" is one of the names of the sun god. It was the sun god who taught this Samhita to the sage Yajnavalkya. There is a long story about this, but let me tell it briefly. Before the time of Yajnavalkya, the Yajurveda was an undivided scripture. Yajnavalkya learned it from Vaisampayana. Later some misunderstanding arose between the two and the guru bade his student to throw up what he had taught him. Yajnavalkya did so and went to the sun god for refuge. The latter taught him a new Vedas, an addition to the scripture that is endless. That is how we came to have Vajasaneyi or Sukla-Yajurveda. The other Yajurveda already taught by Vaisampayana acquired the apellation of "Krsna", so "Krsna-Yajurveda"
In the Krsna-Yajurveda, the Samhita and the abrahmanas do not form entirely different parts. The Brahmanas are appended here and there to the mantras of the Samhita. The glory of the Rgveda is that it is replete with hymns to all deities. Scholars are of the opinion, besides, it contains teachings for our life. The wedding rites are based on tht part of this Veda which pertains to the marriage of the daughter of the sun god. There are also passages of a dramatic character like the dialogue between Pururavas and Urvasi. In later times Kalidasa based one of his dramatic works on this [the Vikramorvasiyam]. The hymn to Usas, the goddess of dawn, and similiar mantras are considered to be of high poetic beauty by men of aesthetic discernment. Since the Rgveda is placed first among the four Vedas it must naturally have an exalted position. It is the matrix of the works (karma) of the Yajurveda and the songs of the Samaveda. The importance of the Yajurveda is that it systematises the karmayoga, the path of works. The Tattitiriya Samhita of the Krsna-Yajurveda deals with sacrifices like darsa-purnamasa, somayaga, vajapeya, rajasuya, asvamedha. Besides it has a number of hymnic mantras of a high order not found in the Rgveda. For example, the popular Sri Rudra mantras are from the Yajurveda. The Rgveda does contain five suktas known as "Pancarudra", but when we mention Sri Rudra we at once think of the mantras to this deity in the Yajurveda. That is why a supreme Saiva like Appayya Diksita laments that he was not born a Yajurvedin - he was a Samavedin. Among the followers of the four Vedas, Yajurvedins predominate. The majority in the North(Brahmins) belong to the Sukla-Yajurveda while most people in the South belong to Krsna-Yajurveda. 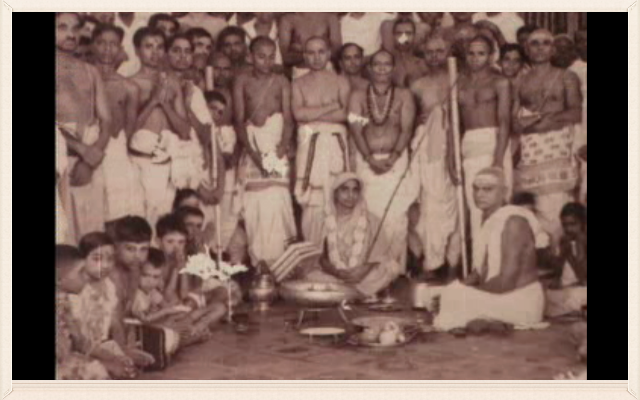 The day on which Yajurvedins perform their upakarma is declared aholiday. There is no such holiday for upakarma of Rgvedins and Samavedins. This is because Yajurvedins are in a majority. The Purusasukta of the Rgveda occurs with some changes in the Yajurveda. Today it is generally understood to be a Yajurvedic hymn. For non-dualists, the Yajurveda has a special importance. A doctrine and its exposition consist of three parts: the sutra, the bhasya and the vartika. The sutra states the doctrine in a apophthegmatic form; the bhasya is a commentary on it; and the vartika is an elucidation of the commentary. To non-dualists the term "vartikakara" at once brings to mind Surasvaracharya. What is the commentary or bhasya for which he wrote his vartika? Sankara's bhasya on the Upanishads are to be regarded as sutras. He wwrote, in addition, a bhasya for the Brahmasutra also. His disciple Suresvara wrote a vartika on his master's commentaries. In this work he chose only two of the ten Upanishads for which Sankara had written his commentary - the Taittiriya Upanishad and the Brhadaranyaka Upanishad. These two are from the Krsna and Sukla- Yajurvedas respectively, which means both are from the Yajurveda. Nother distinction of the Yajurveda is that of the ten Upanishads ("Dasopanishad") the first and the last are from it - the Isavasyopanishadnand the Brhadaranyaka Upanishad. "Sama" denotes that which brings equipoise or tranquillity to the mind. There are four well-known ways of dealing with an opponent or rival: sama, dana, bheda and danda. The first method is that of conciliation, making an enemy a friend through affection. THe Samaveda enables us to befriend the divine forces, even the Paramatman. How do we make a person happy? By praising him. If the panegyricis set to music and sung he would be doubly pleased. Many of the mantras of the Rgveda are intoned with a cadence in the Samaveda; thus we have Samagana. While the rks are chanted with the tonal differences of udatta, anudatta and svarita, the samans are intoned musically according to certain rules. Our music, based on the seven notes (saptasvara), has its origin in Samaveda. All deities are pleased with Samagana. We become recipients of their grace not only through the offerings made in the sacrificial fire but through the intoning of the samans by the udgata. Samagana is particularly important to soma sacrifices in which the essence of the soma plant is offered as oblation. Though the samans are indeed Rgvedic mantras, they are specially capable of pleasing the deities and creating Atmic uplift because they are intoned musically. This is what gives distinction to the Samaveda. Sri Krsna Paramatman says in the Gita : "Vedanam Samavedosmi"(Of Vedas Iam samaveda). The Lord is everything, including good as well as bad. Even so, as he speaks to Arjuna about the things in which his divine quality specially shines forth, he mentions the Samaveda among them. In the Lalitha-Sahasranama (The One Thousand Names of the Goddess Lalitha), Amba has the name of "Samagana-priya (one who delights in Samagana); she is not called "Rgveda-priya" or "Yajurveda-priya". Syamasastri refers to the Goddess Minaksi as "Samagana-vinodhini" in one of his compositions. In the Siva-astottaram ["Siva astottara-satam, the 108 names of Siva], Siva is worshipped thus:"Samapriyaya namah" The Tevaram extols Siva as one who keeps chanting the Chandoga-Saman (Chandoga-Saman odum vayan). Appayya Dikshita has sought to establish that Isvara or Siva, Amba and Visnu are "Ratna-trayi" (the Three Gems) occupying the highest plane. And all three have a special relationship with Samaveda. "Atharvan" means a purohita, a priest. There was a sage with this name. That which was revealed by the seer Athrvan is the Atharvaveda. It contains mantras with which one wards off misfortunes and disasters and brings about the destruction of one's enemies. The Atharvaveda is a mixture of prose and poetry. The mantras of other Vedas also serve the same purpose as those of the Atharvaveda. But what is special about the latter is that it has references to deities not mentioned in the others and has mantras addressed to fierce spirits. What has come to be known as "mantrikam" (magical rites) has its source in this Veda. But it is to be noted that the Atharvaveda also contains mantras that speak of lofty truths. It has the Prithvi-sukta, the hymn to earth, which glorifies this planet with all its creatures. The Atharvaveda is noteworthy for the fact that the brahma, the supervisor of sacrifices, is its representative. The Atharvaveda, that is its Samhita, is rarely chanted in the North and is not heard at all in the South. But we must remember that of the ten important Upanishads three belong to this Veda - Prasna, Mundaka and Mandukya. It is believed that those who seek liberation need nothing to realise their goal other than Madukya Upanishad. We learn from stone inscriptions that the Atharvaveda had a following until some centuries ago. Information about Vedic schools is provided by such inscriptions found near Perani, not far from Tindivanam, at Ennayiram and a place near Walajabad, in the neighbourhood of Kancipuram. Even during the reign of the later Colas the Atharvaveda was learned in the Tamil country. There are eighteen divisions among the Brahmins of Orissa. One of them is made up of "Atharvanikas", that is Atharvavedins. Evev today Atharvavedins are to be met, though their number is small, in parts of Gujarat like Saurashtra and in Kosala( in U. P). Gayatri is the mantra of mantras and it is believed to be the essence of the three Vedas - which means that the Atharvaveda is excluded here. According to one view, before he starts learning the Atharvaveda, a brahmacharin must go through a second upanayana ceremony. Generaly, the Gayatri imparted to a child at Brahmopadesa ceremony is called "Tripada- Gayatri" - it is so called because it has three padas or three feet. Each foot encompasses the essential spirit of one Veda, The Atharvaveda has a seperate Gayatri and if people belonging to other Vedas want to learn this Veda they have to go through a second upanayana to receive instruction in it. For the followers of the first three Vedas, however there is only one Gayatri and those belonging to any one of them can learn the other two Vedas without another upanayana. (See chapters 36 and 38 of this part for more on sakhas or recensions of the Vedas).